Home Comics Do You Have Superpowers? For the second Temporary Superheroine novel, Crisis at Comicon, I dreamed up several over-the-top action sequences, culminating in one big blowout of a scene. 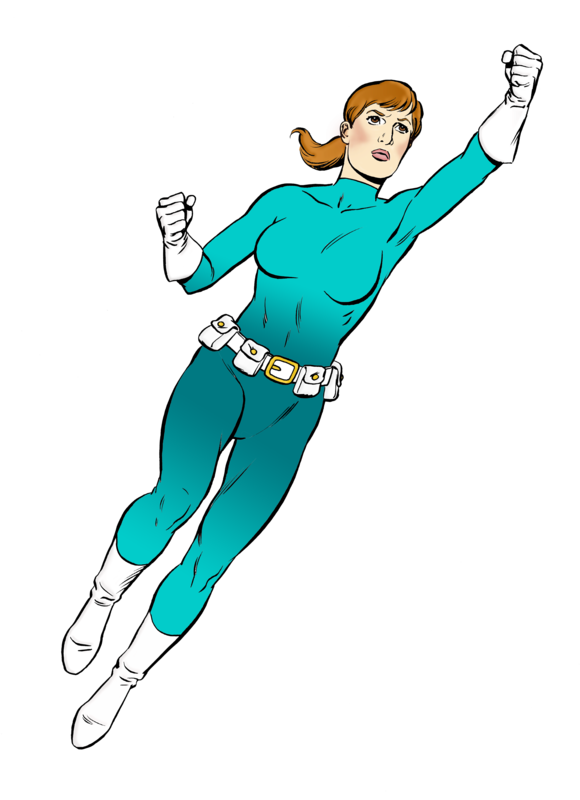 Writing the third Temporary Superheroine novel (which is currently without a title), I’ve sent my reluctant but intrepid heroine Chloe back to the mirror universe, where she has plenty of superpowers at her command. But she can only use them if she knows she has them, and that’s a theme worth thinking about. I don’t recall a story in which Superman or even Superboy discovered and tested his range of powers. He was always aware of them already in the Silver Age tales I read. Sometimes he discovered that he had lost his powers, or that one or more of his powers wouldn’t work, usually because of red Kryptonite. But he wasn’t exploring powers. The 1950s television show with George Reeves did have one episode in which Superman tested (as I dimly recall) whether he could walk through a wall. Otherwise, Superman knew what he could do and what he could not. In fact, he could do so much that in the early 1960s, the story “Superman under the Red Sun” introduced a huge new limitation to his powers that had never existed previously. Superman’s big struggle in that story was dealing with a world in which he did not have superpowers, something he had never fully experienced before. By that time, he was already a veteran superhero with years and years of superpowered exploits behind him. By c ontrast, Chloe is a beginner. A fairly reluctant beginner, as she often says, but I think she’s getting into the groove and realizing that her innate superpowers make her a stronger person than she thought she was. The duality of having powers in one universe and not having them, and needing the intermediary of a jewel to access powers, parallels Chloe’s dual images of herself as lacking power in our real universe, and yet having power from another place and when she is in that other place. Many of us struggle with the concept that we lack power, when in fact we have plenty of power within our family or friend circles, and we have decision-making power, too, that affects the wider world. We have more power to act or to affect events or situations than we think we do. Despite our power, we often think of ourselves as disenfranchised little guys, which leads to feeling helpless or irrelevant to the direction of our society. And it makes us feel really, really useless on some level, too. Chloe’s superpowers force her to confront her innate power. As a female, Chloe has the additional burden of struggling against the flow of male power that dominates our world. It would be foolish to pretend otherwise. Yet despite this, Chloe has the advantage of experiencing efficacy as a superpowered heroine. Her connection to the paranormal world of superpowers allows her to do stuff other people cannot do. Being able to “do stuff” is what adults do, and as Chloe transitions from a very young woman who merely thinks she’s an adult to a genuinely adult woman, she grows into her power. Which is not to say that she will not experience threats to her power. She will. Yet her growth as a superheroine will help her discern the lines of power around her and help her settle on her role in her world. Whichever world she decides that is. Choe’s superpowered adventures are chronicled in Temporary Superheroine and Crisis at Comicon. Book three is in the works!